Alright, now we are getting somewhere. 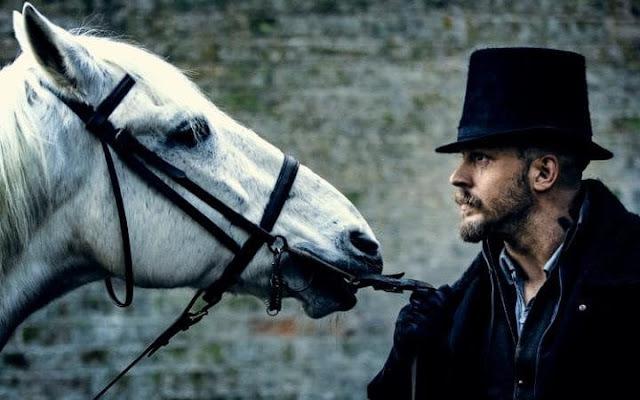 Taboo still doesn't really feel like it is going anywhere, which is an odd thing to say about a limited series that is officially halfway done, and this recent episode is pretty batshit crazy, but I think that's what I liked about it: it was entertaining, which sadly cannot be said for everything that came before it. Even this fourth episode wasn't perfect by any means, I found my mind wandering during the first half of it thinking I was in for another dull letdown, but alas! What a final 20 plus minutes we had here, ripe with a heist and a sequence at a party that was tense, exciting, weird and intriguing. This episode certainly closed out on a note that makes me excited for next week to see where it goes. - It occurs to me that I have no idea what the names of 75 percent of the characters are in the show, and to be honest I don't really care enough to seek out that information. Perhaps these types of aspects will click during the second half of the series, but who knows. I basically went the entire first season of Game of Thrones trying to learn all the names of the expansive ensemble, and I love that show. Problem is there is no season 2 of Taboo, so a lack of interest in knowing more about characters outside of the main two or three is an issue. - Even at its low points, Taboo is a well realized series in regards to capturing the period it takes place in, through costumes, set design, and general aesthetic. It's gorgeous to look at always which actually makes it more damning that there are times I look away due to lack of interest. I really hope the second half of this episode leads into what turns out to be a terrific rest of the show. I'm optimistic, I guess. Much like in regards to how much I have really enjoyed Taboo as a whole thus far, I am still trying to make sense of my confidence level in this story going forward as well.